Homegrown Tap & Dough is an Italian pizzeria with a tad of Colorado flare. 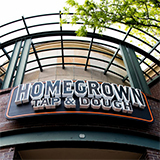 Well-known amongst Denverites for using only fresh, high-quality ingredients, Homegrown Tap & Dough crafts house made specialty pasta and hand tossed, wood-fired gourmet pizza. The inviting atmosphere accommodates families with kids, business meetings, date nights, sports viewings and more.